Innovative Asian Student Project Competition was organized to recognize the best social innovators in Asia Pacific. The theme for this year was “Enhancing the quality of Life through Innovation”. Innovative Asian Student Project Competition was organized to recognize the best social innovators in Asia Pacific. The theme for this year was “Enhancing the quality of Life through Innovation”. Students from Universities all over Asia and Middle East participated and displayed their engineering skills. The first level contest was conducted in August 2016 in which 16,877 teams participated. At the final level 10 top teams were selected to participate and the contest was held at Mumbai on 28th June 2017. A team of students Anand M, (team leader), Mariam Afrah A, Rangala Dharmaraju and Ishant Dubey belonging to the department of Aeronautical Engineering, Bharath University represented India among the top 10 teams selected for the final. They proposed innovative ideas for alternate power generation systems for aircraft engines. They have used hydrogen and oxygen through hydrolysis of sea water as the fuel for the jet engine insread of the conventional jet kerosene which will lead to significant decrease in CO2 emissions in the near future. 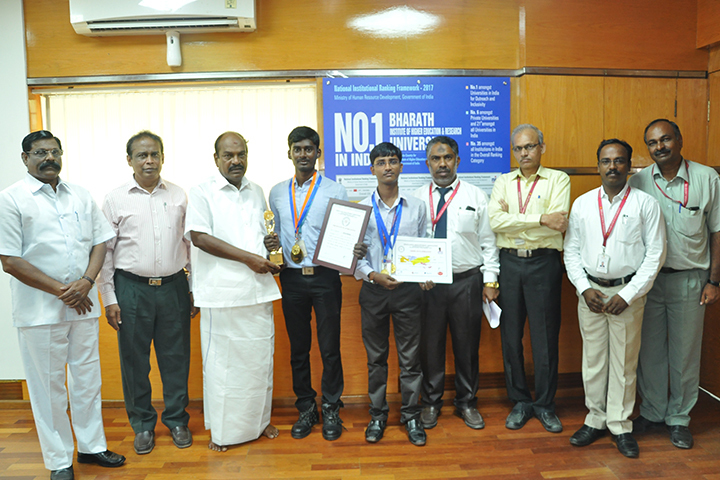 The idea proposed by the Bharath team was welcomed bythe selection committee and was declared as the second runner by the jury. 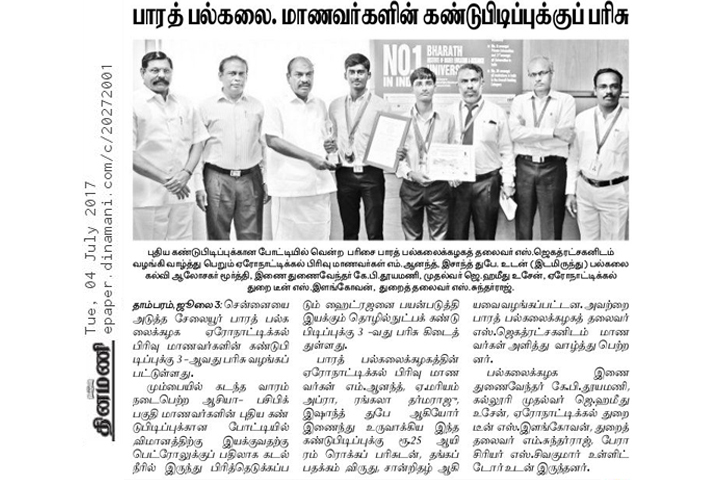 The team leader Anand M was honored with the prestigious "Young Scientist Award" for his commitment in research. The team was guided by Dr. S. Elangovan, Professor & Dean, and Dr. M. Sundararaj, Associate Professor & Head of the Department of Aeronautical engineering, Bharath university. Mr. Murthy I.A.S(R) (Adviser), Prof.Dr. K. P. Thooyamani (Pro VC), Dr.S. Jagathratchagan (Chairman), M Anand (Team Leader), Ishant Dubey, Dr. Hameed Hussain (Dean Engineering), Dr.S.Elangovan (Dean Aeronautical), Dr.M.Sundararaj (HOD Aeronautical), Dr.S.Sivakumar (Professor Aeronautical).